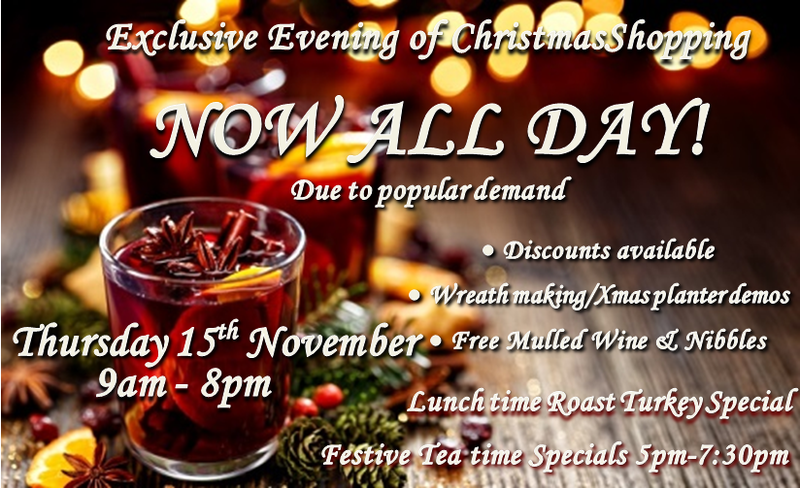 Due to popular demand our Exclusive Evening of Christmas Shopping is now ALL DAY! Join us to celebrate the launch of our fabulous Christmas range and festive menu. ❄Enjoy FREE Mulled wine and nibbles on arrival. ❄Jon will demonstrate how to make a traditional holly wreath at 6pm & 7pm. ❄Tips on planting up a winter container will be given by Louise at 6:30pm & 7:30pm. The Cafe will be serving festive tea time specials, including roast turkey with all the trimmings, alongside the full menu from 5pm - 7:30 pm. This will be our first ever Christmas Open Day, come and join us for some festive fun with friends and family.